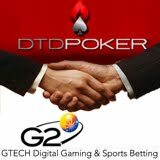 Nottingham’s Dusk Till Dawn Poker Club is switching the Casino and Poker software at its Online Casino and Poker Room from Cryptologic to GTECH G2. In a new three-year partnership, GTECH G2 will also supply the Casino and Poker site with its Webdollar Cashier payment system. This means DTD players won’t have to transfer funds from their Poker account to their Casino account when they want to switch from Poker to Casino games – players can simply use the same wallet for both Casino and Poker. GTECH G2’s International Poker Network (IPN) has been growing and its software and network were recently upgraded to give players more choices at the table and more convenience at the cashier. With more than 3,000,000 active players, the IPN is now Europe’s largest independent poker network. GTECH G2 is renowned for the attention to detail in its realistic Casino games. With its open architecture, licensees can easily add new Casino games and Instant Games from GTECH G2 or other Casino game suppliers.